Thrifting, a photo by Jeni Baker on Flickr. Hi There! Earlier this week I shared the above photo of my recent thrifting finds! I thought it might be fun to share with you a few of the things that didn't come home with me! 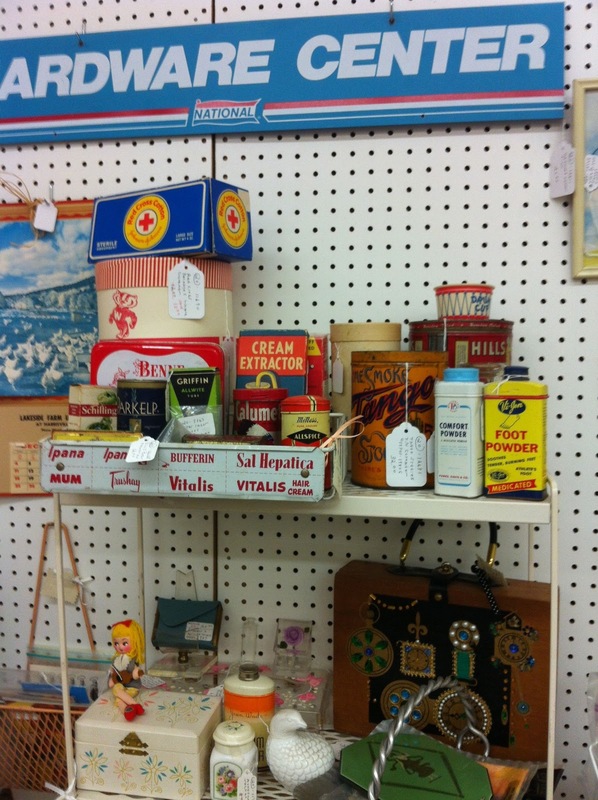 So, would you like to take a trip to a few antique shops? Let's go! How cute are these tiny tupperwares? They look like mini cake carriers! Maybe for cupcakes? 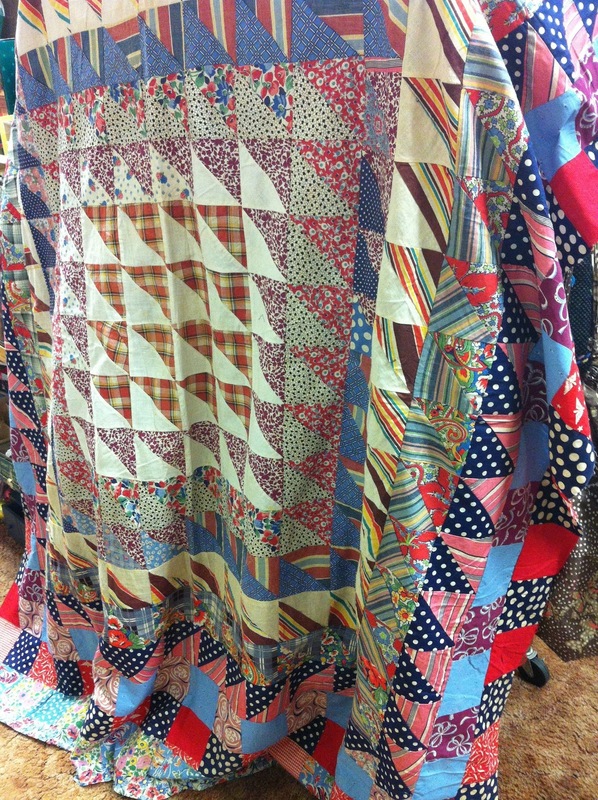 Loved this vintage quilt top, so many cool prints. Sometimes the packaging is more interesting than the item itself! 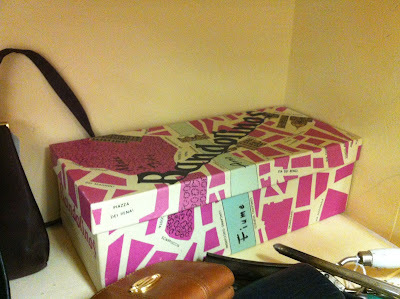 Take my word for it, the shoes weren't anything too special! *Sigh*, I really wanted to come home with these Pyrex bowls! But, they were too expensive! This little condiment set kills me. It's so little! Another thing I wish I could have brought home! 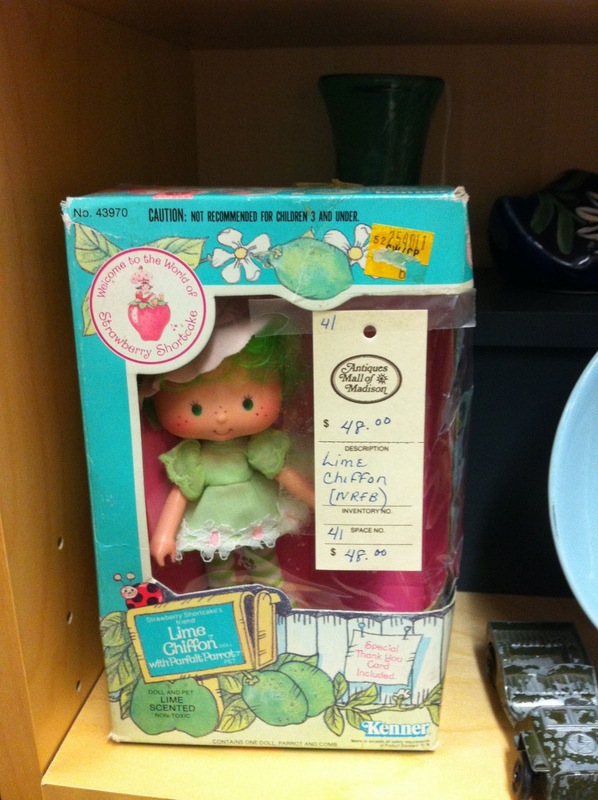 One of Strawberry Shortcake's friends, new in the box! I have a thing at the moment for vintage tins. I don't know what it is, I can't get enough of them! Really liked the plaid print on this vanity chair. It was super bright! Wouldn't mind bringing that phone home either! Yep, love teak and stainless steel together. Two great serving pieces! I hope that was fun! Next time I'll share some thrift store shots, I'm usually going in and out of thrift stores so quickly, I forgot to take any photos! 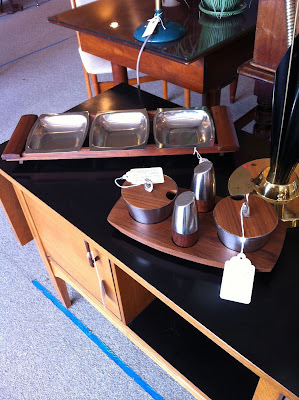 I love those pyrex stripe bowls and the condiment set! What you bought is all gorgeous too! xo. Oh my that cathedral window quilt would have been hard to leave behind. But the bowl you did bring home is fabulous! What a lot of fun things you saw! 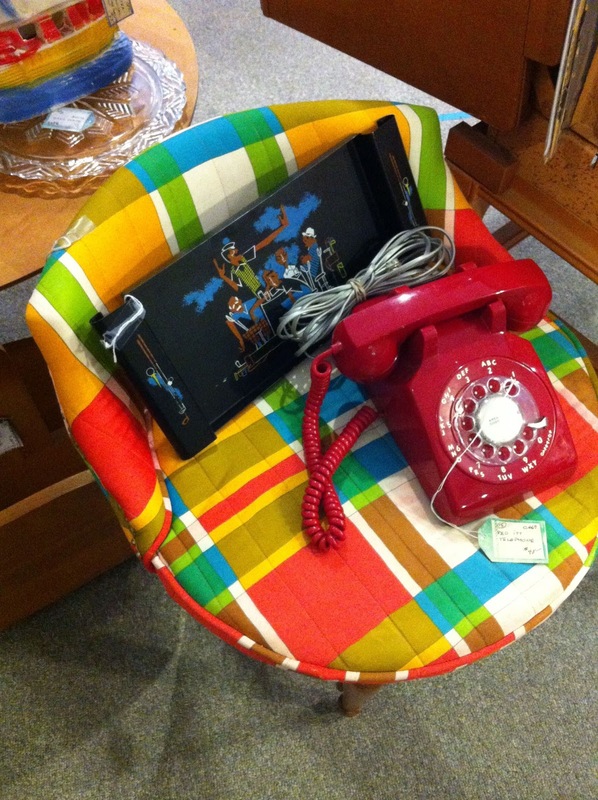 LOL...that red phone looks just like the one my parents had from before I was born until I was grown.....I think it is in their basement now. I had one of those Tupperware containers when I was a kid! I put the handle on the other way and used it to pick berries! You have strong willpower to leave those all sitting on the shelf! Those antique shops are awesome! My local shops aren't near that exciting, you have to search and search for the cool things! Wherever do you live? I want to come and go thrift shopping with you! I'd love to know where this shop is. They have a lot of great stuff! Thanks for sharing the treasures that became looty and those that didn't! As I live in the area, would you mind sharing the name of the store? That cathedral window quilt is breathtaking! 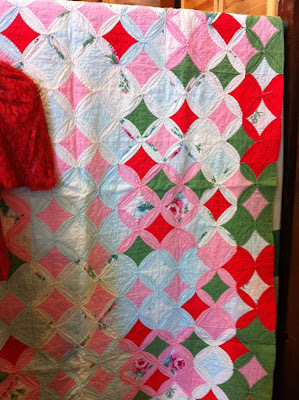 The cathedral window quilt caught my eyes.Excellent!! Your thrift stores seem to have much cooler stuff than mine do. Maybe I'm too far south. Great finds you've got there. They look cool than those we can buy in stores nowadays. Thrift stores are the place to be if you want to find vintage stuffs and the like. Are you considering selling the Finel bowl? 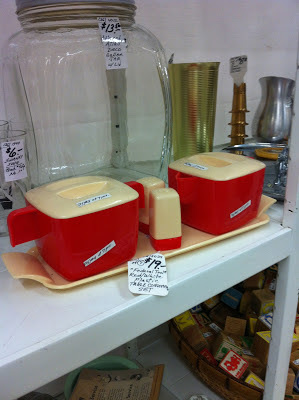 The Tupperware Mini Cake Taker is part of a child's set they don't sell anymore. They have a new set right now that has another one identical to that but with designs to match the rest of the little set. 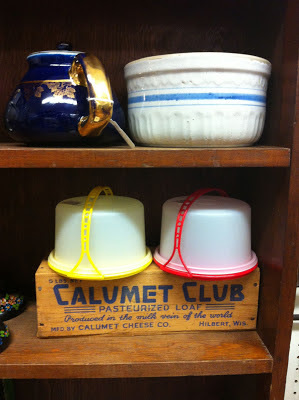 Those were really popular back when I was a Tupperware manager years ago. All my friends ordered one for their little girls. 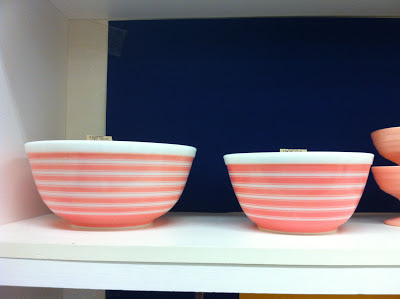 Those Pyrex bowls and that chair just might have come home with me, depending on just how expensive they were.